Brinks Gilson & Lione has significant experience in USPTO administrative proceedings including re-examinations, interferences, and the new proceedings created by the AIA including inter partes reviews (IPR) and Covered Business Method patent reviews (CBM). 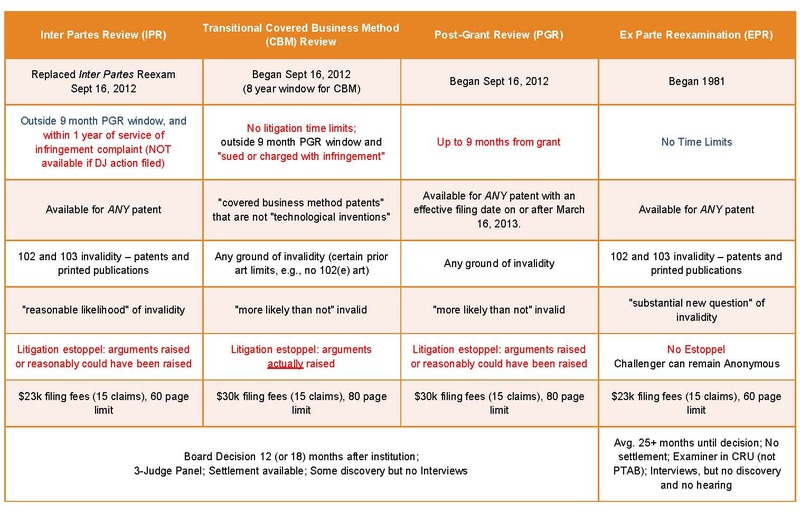 Although IPRs and CBMs have only been available for a few years, Brinks has jumped to the forefront of this new type of proceeding and has been involved in over 90 cases before the Patent Trial and Appeal Board (“PTAB”) and several subsequent appeals to the Federal Circuit. To view a listing of representative Post-Grant Patent proceedings matters, several of which are discussed in the following paragraphs, click here. To view a Summary Comparison of Post-Grant Proceedings click here. In four petitions for IPRs filed on two patents for client FLIR Systems, Brinks obtained complete victory. Brinks’ experience in post-grant proceedings enabled it to successfully navigate what proved to be a very procedurally-complex IPR, which included 14 depositions over a compressed schedule, as well as numerous motions and conferences with the PTAB judges. Brinks prevailed when the PTAB held unpatentable each of the 76 claims of the two patents challenged by our client. In a petition for IPR filed for a client in the automobile industry, Brinks successfully invalidated the majority of claims of a patent covering tire pressure monitoring systems for automobiles, including the lone independent claim. Brinks employed narrow, targeted anticipation and obviousness arguments based on a select handful of prior art references to succeed at the PTAB. In three petitions recently filed for a chemical company, Brinks is currently challenging a competitor's patent claims for the manufacture of fluorinated olefins, which are touted as the next generation of refrigerant and as the worldwide replacement for HFCs.